In Issue 6, questions of existence are considered with and against the work of others who have, in their respective ways, dealt with this issue. Nietzsche's theory of nihilism is examined, along with the implications of Michelstaedter's theory of persuasion and rhetoric considered in light of his suicide, and also, a piece which tries to locate the relevance of developing Max Stirner's ideas beyond the domain of mere egoism. This issue starts with a piece titled 'Aphorisms and Aggravations,' in which the horrors of the Manson Family are considered as a microcosm for society, politicized eastern religion resembles fascism, makeup hides rather than enhances sexual value and spiritualities can be purchased like any other atomized commodity for the sake of comfort. Tagged with the burning block, the burning block no. 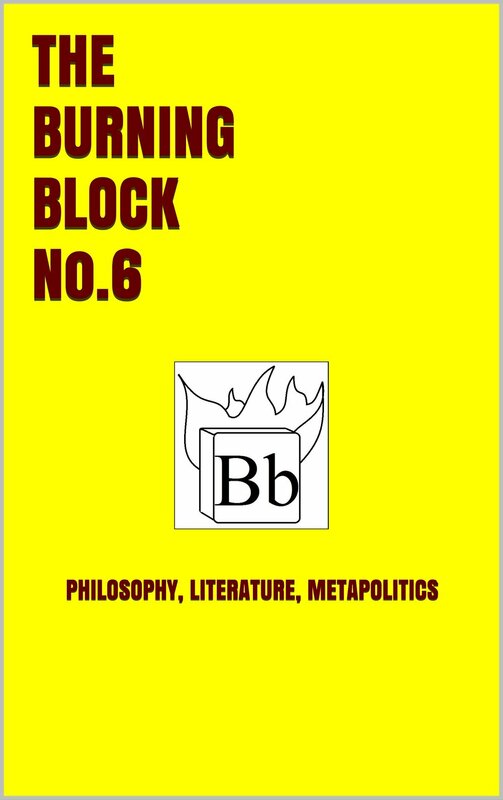 6, the burning block vol i.
August 20, 2018 by Shane Eide.